CobW proteins are generally found proximal to the trimeric cobaltochelatase subunit CobN, which is essential for vitamin B12 (cobalamin) biosynthesis (PUBMED:12869542). They contain a P-loop nucleotide-binding loop in the N-terminal domain and a histidine-rich region in the C-terminal portion suggesting a role in metal binding, possibly as an intermediary between the cobalt transport and chelation systems. CobW might be involved in cobalt reduction leading to cobalt(I) corrinoids. 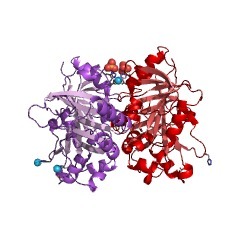 This entry represents the C-terminal domain found in CobW, as well as in P47K, a Pseudomonas chlororaphis protein needed for nitrile hydratase expression (PUBMED:7765511). Cobalamin (vitamin B12) is a structurally complex cofactor, consisting of a modified tetrapyrrole with a centrally chelated cobalt. Cobalamin is usually found in one of two biologically active forms: methylcobalamin and adocobalamin. Most prokaryotes, as well as animals, have cobalamin-dependent enzymes, whereas plants and fungi do not appear to use it. In bacteria and archaea, these include methionine synthase, ribonucleotide reductase, glutamate and methylmalonyl-CoA mutases, ethanolamine ammonia lyase, and diol dehydratase [(PUBMED:12869542)]. In mammals, cobalamin is obtained through the diet, and is required for methionine synthase and methylmalonyl-CoA mutase [(PUBMED:17163662)]. Aerobic pathway that requires oxygen and in which cobalt is inserted late in the pathway [(PUBMED:16042605)]; found in Pseudomonas denitrificans and Rhodobacter capsulatus. Anaerobic pathway in which cobalt insertion is the first committed step towards cobalamin synthesis [(PUBMED:12055304), (PUBMED:23922391)]; found in Salmonella typhimurium, Bacillus megaterium, and Propionibacterium freudenreichii subsp. shermanii. Either pathway can be divided into two parts: (1) corrin ring synthesis (differs in aerobic and anaerobic pathways) and (2) adenosylation of corrin ring, attachment of aminopropanol arm, and assembly of the nucleotide loop (common to both pathways) [(PUBMED:11215515)]. There are about 30 enzymes involved in either pathway, where those involved in the aerobic pathway are prefixed Cob and those of the anaerobic pathway Cbi. Several of these enzymes are pathway-specific: CbiD, CbiG, and CbiK are specific to the anaerobic route of S. typhimurium, whereas CobE, CobF, CobG, CobN, CobS, CobT, and CobW are unique to the aerobic pathway of P. denitrificans. CobW proteins are generally found proximal to the trimeric cobaltochelatase subunit CobN, which is essential for vitamin B12 (cobalamin) biosynthesis [(PUBMED:12869542)]. They contain a P-loop nucleotide-binding loop in the N-terminal domain and a histidine-rich region in the C-terminal portion suggesting a role in metal binding, possibly as an intermediary between the cobalt transport and chelation systems. CobW might be involved in cobalt reduction leading to cobalt(I) corrinoids. 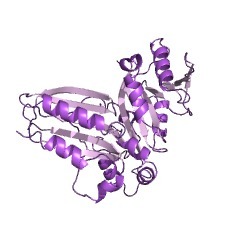 This entry represents the C-terminal domain found in CobW, as well as in P47K (P31521), a Pseudomonas chlororaphis protein needed for nitrile hydratase expression [(PUBMED:7765511)]. There are 28563 CobW_C domains in 28559 proteins in SMART's nrdb database. Taxonomic distribution of proteins containing CobW_C domain. This tree includes only several representative species. The complete taxonomic breakdown of all proteins with CobW_C domain is also avaliable. Click on the protein counts, or double click on taxonomic names to display all proteins containing CobW_C domain in the selected taxonomic class. Comparative genomics of the vitamin B12 metabolism and regulation inprokaryotes. Using comparative analysis of genes, operons, and regulatory elements, wedescribe the cobalamin (vitamin B12) biosynthetic pathway in availableprokaryotic genomes. Here we found a highly conserved RNA secondarystructure, the regulatory B12 element, which is widely distributed in theupstream regions of cobalamin biosynthetic/transport genes in eubacteria.In addition, the binding signal (CBL-box) for a hypothetical B12 regulatorwas identified in some archaea. A search for B12 elements and CBL-boxesand positional analysis identified a large number of new candidateB12-regulated genes in various prokaryotes. Among newly assigned functionsassociated with the cobalamin biosynthesis, there are several new types ofcobalt transporters, ChlI and ChlD subunits of the CobN-dependentcobaltochelatase complex, cobalt reductase BluB, adenosyltransferase PduO,several new proteins linked to the lower ligand assembly pathway,l-threonine kinase PduX, and a large number of other hypotheticalproteins. Most missing genes detected within the cobalamin biosyntheticpathways of various bacteria were identified as nonorthologoussubstitutes. The variable parts of the cobalamin metabolism appear to bethe cobalt transport and insertion, the CobG/CbiG- and CobF/CbiD-catalyzedreactions, and the lower ligand synthesis pathway. The most interestingresult of analysis of B12 elements is that B12-independent isozymes of themethionine synthase and ribonucleotide reductase are regulated by B12elements in bacteria that have both B12-dependent and B12-independentisozymes. Moreover, B12 regulons of various bacteria are thought toinclude enzymes from known B12-dependent or alternative pathways. Nitrile hydratase gene from Rhodococcus sp. N-774 requirement for itsdownstream region for efficient expression. For improvement of the production of nitrile hydratase (NHase) fromRhodococcus sp. N-774 by recombinant DNA techniques, several plasmids,each of which had a deletion of the upstream or downstream region of thegenes encoding the alpha and beta subunits of NHase, were constructed.Enzyme assays of recombinant R. rhodochrous and Escherichia coli cellsshowed that a downstream region of the NHase genes was indispensable forthe production of active NHase in both cells, but for the production ofthe active amidase, no genes other than the amidase structural gene wererequired. The nucleotide sequence of the downstream region contained asingle open reading frame (Orf1188) with 396 amino acids. Orf1188 showedsimilarity in amino acid sequence to P47K, an open reading frame founddownstream of the NHase genes from Pseudomonas chlororaphis B23, and alsoto the cobW gene product, which may be involved in cobalamin biosynthesisin Pseudomonas denitrificans. Because the distance between the TGA stopcodon for the NHase beta-subunit and the ATG codon for Orf1188 is only 98bp, and because production of both Orf1188 and NHase is dependent on apromoter upstream of the amidase gene, these genes appear to beco-transcribed in a polycistronic manner, forming an operon. Byoptimization of the culture conditions of R. rhodochrous carrying pKRNH2,which contained the amidase, NHase, and Orf1188 genes, the transformantshowed the NHase activity 6-fold higher than that of the original strain,Rhodococcus sp. N-774. This information is based on mapping of SMART genomic protein database to KEGG orthologous groups. Percentage points are related to the number of proteins with CobW_C domain which could be assigned to a KEGG orthologous group, and not all proteins containing CobW_C domain. Please note that proteins can be included in multiple pathways, ie. the numbers above will not always add up to 100%.